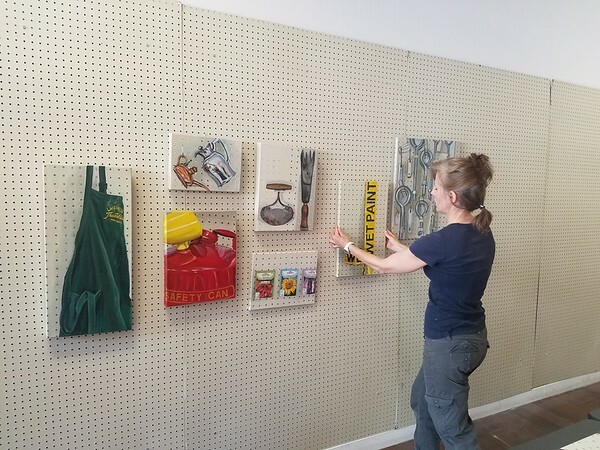 NEW BRITAIN - Wednesday was Stamford artist Rachel Lussier’s last day at the New Britain Industrial Museum after spending the past two weeks creating an art piece. Lussier had a series of paintings in the city last summer at Gallery 66, and the New Britain Industrial Museum helped facilitate that show. “To return the favor, I said, ‘How about I come to the museum and I will do a painting of the New Britain Industrial Museum’s collection, and the result of that painting, I want to give it to the museum so they can raffle it as a fundraising device,’ ” Lussier said. The piece Lussier painted was the E.A. Moore Stanley Tool Chest. It had been given to a former president of The Stanley Works. During the process, visitors were welcome to stop by, watch and ask questions. Lussier said she enjoyed having people look over her shoulder and sharing the process with them. To learn more about the Industrial Museum visit www.nbindustrial.org or call 860-832-8654. To learn more about Lussier, visit her website at www.rachellussierart.com . Posted in New Britain Herald, , New Britain on Thursday, 24 January 2019 20:54. Updated: Thursday, 24 January 2019 20:56.